In this study, waste tires-biaxial geogrids combining reinforced retaining walls were thoroughly investigated using the independently-developed apparatus for simulating cyclic loading. A comparative analysis was conducted between biaxial geogrids, waste tires, geocells, and different layout schemes of tire-geogrids. 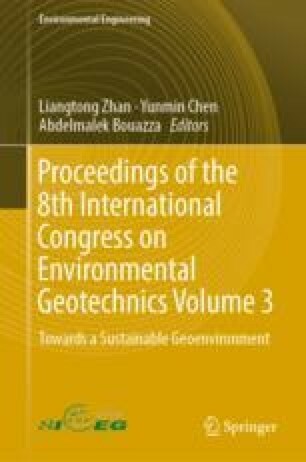 The dynamic earth pressures and accelerations of different reinforced retaining walls subjected to cyclic loading were investigated to determine the optimal combining scheme of tire-geogrids. The tests demonstrate that the tire-geogrid reinforcement materials are propitious to enhancing anti-seismic performance and the stability of reinforced retaining walls. Additionally, in the scheme of tire-geogrid reinforcement, the effectiveness is better when the space between tires equals to the radius of the tire, which could save 30% of material cost. Under the cyclic load, the dynamic earth pressure and acceleration of the tire-geogrid reinforced retaining wall increase with increasing relative wall height (y/H). The acceleration peaks at the top of the wall. Moreover, the dynamic earth pressure changes with the variations of cyclic loading amplitude, and after reaching its peak value, the growth rate slows down and the value becomes stable. This work was supported by the National Natural Science Foundation of China (No. 51678224, 51708190 and 51778217), National Program on Key Research Project of China (No. 2016YFC0502208) and the Hubei Provincial Science Foundation for Distinguished Young Scholars (No. 2018CFA063).